1-Lightly sand the surface of the wooden plate and remove the dust. 2-Paint metalic pearl color in two coats.Let it dry. 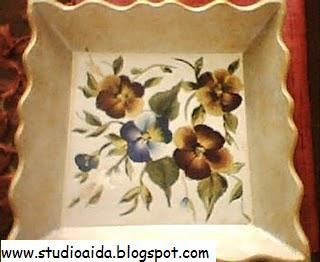 3-How to paint pansies:Pansies are very easy to draw. For double loading, dip one corner of the bristles in light color and then the other corner in dark color. 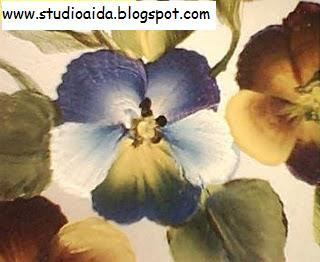 The two colors should meet a little in the middle of the brush.Paint pansies and leaves with double loading colors.One stroke painting is a technique and anyone can learn. 4-Apply a coat of sealer. These are absolutely gorgeous!! I have always wanted to paint. My daughter is an artist, but I do well to draw a stick figure! !